You’re probably already aware of the health virtues of common white garlic, but you may be surprised by the benefits of its black counterpart. Also known as matured or aged garlic, the black variety differs from traditional garlic in that it is produced via a unique maturation process. Black garlic is becoming increasingly popular not only for its distinctive flavour but also for its health benefits, with many scientific studies demonstrating its exceptional properties. Let’s take a closer look at these properties to understand more about black garlic’s preventive and therapeutic potential. Why all the interest in black garlic? Since the beginning of the 2000s, a number of articles have been published on the benefits of this particular form – it is hailed both for its flavour and its health virtues. Indeed, black garlic has already won over the taste buds of leading chefs with its subtle and distinctive flavour. In addition, this new form of garlic boasts an exceptional composition, containing numerous active compounds - the result of its unique production process. Sometimes referred to as fermentation, the technique is in fact one of maturation. Bulbs of common white garlic are left for several days in a container or enclosed place, in very specific atmospheric conditions at a temperature of 60°C-80°C and a humidity of 70%-90%1. Under these precise conditions, the garlic bulbs gradually transform as a result of the Maillard reaction – inducing a slow caramelisation which is responsible for the resulting black garlic’s subtle flavour and high concentration in active principles. Indeed, it is believed to have a greater concentration and diversity of active compounds than traditional garlic. During the maturation process, a number of white garlic’s molecules such as allicin are converted into active principles. Benefitting from an exceptional composition, black garlic is recognised above all for its high antioxidant content, with one such substance - S-allyl-cysteine - proving of particular scientific interest for its high antioxidant potency. A study published in 2012 in the journal Oxidative Medicine and Cellular Longevity showed that this natural antioxidant is especially abundant in black garlic, unlike common white garlic which contains only small amounts². As a result of the presence of this phenolic compound, black garlic is able to help fight oxidative stress, free radical damage and cellular ageing. In addition to this protective effect, the antioxidant power of S-allyl-cysteine may offer other health benefits, particularly for the cardiovascular system. With its natural antioxidant power, black garlic is also proving beneficial in protecting the cells of the cardiovascular system. Consuming black garlic may also improve the lipid profile, an important factor in protecting against cardiovascular problems. This beneficial effect was the object of a 12-week, placebo-controlled study published in 2014 in the journal Nutrition3, in which researchers evaluated the therapeutic potential of black garlic among 55 patients with hypercholesterolaemia (high blood cholesterol levels). They found increases in ‘good’ HDL-cholesterol in patients supplemented with 6g/day of black garlic compared with those given a placebo. These are highly encouraging results which strongly suggest a cardio-protective effect for this edible plant. Further studies are underway to assess the extent of its benefits for the cardiovascular system. Black garlic’s therapeutic potential also opens up promising new approaches for preventing and treating other health disorders. Black garlic’s health virtues come from its exceptional content in active compounds. Some researchers have estimated that black garlic could contain over 100 active compounds. While the antioxidant potency of S-allyl-cysteine is widely-recognised, other molecules are also attracting the interest of the scientific community. This is particularly so in the case of two new compounds – AGE-1 and AGE-2 – which a number of studies suggest have anti-inflammatory effects. In attempting to evaluate these effects, a team of Korean researchers monitored levels of various molecules involved in the inflammatory response such as nitric oxide, prostaglandin E2 and .pro-inflammatory cytokines (interleukin 6, or IL=6, TNF-α, et IL-1β). They also measured the mRNA and protein expression levels of nitric oxide synthase and cyclooxygenase-2, also involved in the inflammatory response. Published in 2017 in the journal Phytotherapy Research, their findings confirmed the anti-inflammatory action of the compound AGE-14 which, in a dose-dependent manner, reduced levels of nitric oxide and prostaglandin 2. Secretion of pro-inflammatory cytokines (IL-6, TNF-α and IL-1β) was similarly suppressed by the action of AGE-1.This molecule also appears to reduce the mRNA and protein expression of nitric oxide synthase, and cyclooxygenase-2. While further studies are required, these observations suggest that the AGE-1 compound present in black garlic may have a potent anti-inflammatory effect. 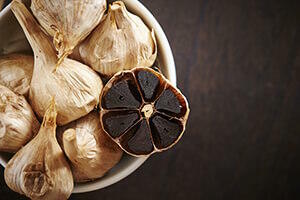 These various findings on black garlic explain the growing interest in this exceptional product. Its antioxidant power could prove to be a valuable aid for preventing or treating a number of health disorders. Studies are currently in progress to identify all its benefits and therapeutic potential. While it is still difficult to obtain raw black garlic, it is available in the form of a dietary supplement called ABG10+®. This patented form has been specially formulated from an extract standardised to 0.1% S-allyl-cysteine to offer the health virtues of black garlic. An extract of black garlic with antioxidant and cardio-protective powers.